Hamoukar (in Arabic: حموكار) is a large archaeological site located in the Jazira region of northeastern Syria (Al Hasakah Governorate), near the Iraqi and Turkish borders. 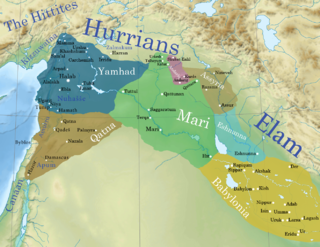 The early settlement dates back to the 5th millennium BCE, and it existed simultaneously with the Ubaid and the early Uruk cultures. It was a big centre of obsidian production. In the 3rd millennium, this was one of the largest cities of Northern Mesopotamia, and extended to 105 ha. It is now believed that Hamoukar was thriving as far back as 4000 BC and independently from Sumer. The origins of urban settlements has generally been attributed to the riverine societies of southern Mesopotamia (in what is now southern Iraq). This is the area of ancient Sumer, where around 4000 BC the Mesopotamian cities such of Ur and Uruk emerged. 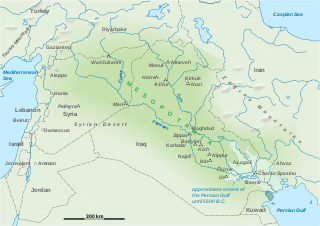 In 2007, following the discoveries at Hamoukar, some archaeologists have argued that the Cradle of Civilization could have extended further up the Tigris River and included the part of northern Syria where Hamoukar is located. The city flourished before the invention of writing. It also featured specialization of labor. Other contemporary early sites in this area are Chagar Bazar, Tell Arbid, and the multi-period site of Tell Brak. Thousands of clay sealings have been found on the site, indicating the existence of a complex bureaucratic system before the invention of writing. These sealings were once used to lock doors or containers and were impressed with stamp seals. Large quantities of obsidian were found on the site, indicating the existence of the obsidian production facilities of both weapons and tools. The volcanic rock of this type does not occur in Hamoukar area, so it must have been imported. The nearest deposits are located in the area of Mount Nemrut (today's Turkey), about 170 km north of the city. This is confirmed by chemical analysis of the obsidian. The findings were a surprise for many archaeologists, since they indicate the existence of independent trading networks in the northern Mesopotamia outside of the influence of southern cities, such as Ur and Uruk. The obsidian workshops were spread across a large area of 280 hectares. They were in use as early as 4500 BC. The town lay on an important trade route between Anatolia and southern Mesopotamia. Many Nineveh 5 period artifacts (early 3rd millennium) were found. The city also flourished during the later Akkadian Empire. Eye Idols made of alabaster or bone have been found in Tell Hamoukar. Eye Idols have also been found in Tell Brak, the biggest settlement from Syria's Late Chalcolithic period. Excavation work undertaken in 2005 and 2006 has shown that this city was destroyed around 3500 BC. This may be the evidence of the earliest urban warfare attested so far in the archaeological record of the Near East. Slings and thousands of clay bullets have been found -- evidence of the siege that the city endured. Contained excavations in 2008 and 2010 tried to expand on that. The city could have fallen victim to the Uruk expansion around 3500 BC. There are remains of an Uruk trading colony in the area. Yet, according to the archaeologist Clemens Reichel, the evidence of who exactly was responsible for the destruction of Hamoukar is not entirely clear, since the Uruk trading colony was probably also destroyed at the same time as the big battle was taking place. ^ McGuire G. 2000, „Hamoukar - Early City in Northeastern Syria”, [in:] The Oriental Institute News and Notes, nr 166, Chicago, 1 – 8, 18 – 19. ^ "Archaeologists Unearth a War Zone 5,500 Years Old"
"In the Ruins: Tell Hamoukar", New York Times Science Video (January 16, 2007). "New details of first major urban battle emerge along with clues about civilization’s origins", press release by University of Chicago News Office (January 16, 2007). "University of Chicago-Syrian team finds first evidence of warfare in ancient Mesopotamia", press release by University of Chicago News Office (December 16, 2005). 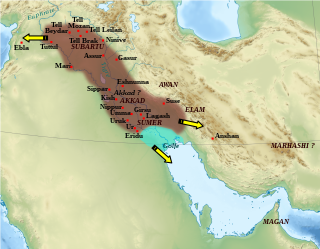 The Akkadian Empire was the first ancient empire of Mesopotamia, centered in the city of Akkad and its surrounding region, which the Bible also called Akkad. The empire united Akkadian and Sumerian speakers under one rule. The Akkadian Empire exercised influence across Mesopotamia, the Levant, and Anatolia, sending military expeditions as far south as Dilmun and Magan in the Arabian Peninsula. Ur was an important Sumerian city-state in ancient Mesopotamia, located at the site of modern Tell el-Muqayyar in south Iraq's Dhi Qar Governorate. Although Ur was once a coastal city near the mouth of the Euphrates on the Persian Gulf, the coastline has shifted and the city is now well inland, on the south bank of the Euphrates, 16 kilometres from Nasiriyah in modern-day Iraq. Eridu is an archaeological site in southern Mesopotamia. Eridu was long considered the earliest city in southern Mesopotamia and is still today argued to be the oldest city in the world. Located 12 km southwest of Ur, Eridu was the southernmost of a conglomeration of Sumerian cities that grew around temples, almost in sight of one another. These buildings were made of mud brick and built on top of one another. With the temples growing upward and the village growing outward, a larger city was built. In Sumerian mythology, Eridu was originally the home of Enki, later known by the Akkadians as Ea, who was considered to have founded the city. His temple was called E-Abzu, as Enki was believed to live in Abzu, an aquifer from which all life was believed to stem. 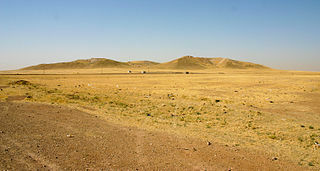 Nippur was among the most ancient of Sumerian cities. It was the special seat of the worship of the Sumerian god Enlil, the "Lord Wind", ruler of the cosmos, subject to An alone. Nippur was located in modern Nuffar in Afak, Al-Qādisiyyah Governorate, Iraq. Adab or Udab was an ancient Sumerian city between Telloh and Nippur. It was located at the site of modern Bismaya or Bismya in the Wasit Province of Iraq. Tell Leilan is an archaeological site situated near the Wadi Jarrah in the Khabur River basin in Al-Hasakah Governorate, northeastern Syria, a region formerly a part of ancient Assyria. The site has been occupied since the 5th millennium BC. During the late third millennium, the site was known as Shekhna. During that time it was under control of the Akkadian Empire. Around 1800 BC, the site was renamed "Shubat-Enlil" by the Assyrian king, Shamshi-Adad I and it became the capital of Assyria in northern Mesopotamia. Shubat-Enlil was abandoned around 1700 BC. Tell Brak was an ancient city in Syria; its remains constitute a tell located in the Upper Khabur region, near the modern village of Tell Brak, 50 kilometers north-east of Al-Hasaka city, Al-Hasakah Governorate. The city's original name is unknown. During the second half of the third millennium BC, the city was known as Nagar and later on, Nawar. Eshnunna was an ancient Sumerian city and city-state in central Mesopotamia. Although situated in the Diyala Valley north-east of Sumer proper, the city nonetheless belonged securely within the Sumerian cultural milieu. 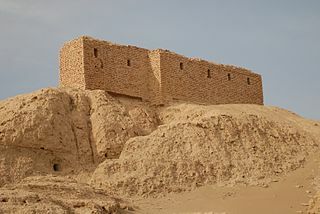 Jemdet Nasr is a tell or settlement mound in Babil Governorate (Iraq) that is best known as the eponymous type site for the Jemdet Nasr period. The site was first excavated in 1926 by Stephen Langdon, who found proto-cuneiform clay tablets in a large mudbrick building thought to be the ancient administrative centre of the site. A second season took place in 1928, but this season was very poorly recorded. Subsequent excavations in the 1980s under British archaeologist Roger Matthews were, among other things, undertaken to relocate the building excavated by Langdon. These excavations have shown that the site was also occupied during the Ubaid, Uruk and Early Dynastic I periods. Girsu was a city of ancient Sumer, situated some 25 km (16 mi) northwest of Lagash, at the site of modern Tell Telloh, Dhi Qar Governorate, Iraq. The Early Dynastic period is an archaeological culture in Mesopotamia that is generally dated to c. 2900–2350 BC and was preceded by the Uruk and Jemdet Nasr periods. It is part of the History of Mesopotamia. It saw the development of writing and the formation of the first cities and states. The ED itself was characterized by the existence of multiple city-states: small states with a relatively simple structure that developed and solidified over time. This development ultimately led to the unification of much of Mesopotamia under the rule of Sargon, the first monarch of the Akkadian Empire. Despite this political fragmentation, the ED city-states shared a relatively homogeneous material culture. Sumerian cities such as Uruk, Ur, Lagash, Umma, and Nippur located in Lower Mesopotamia were very powerful and influential. To the north and west stretched states centered on cities such as Kish, Mari, Nagar, and Ebla. Tepe Gawra is an ancient Mesopotamian settlement in the Mosul region of northwest Iraq that was occupied between 5000 and 1500 BC. It contains remains from the Halaf period, the Ubaid period, and the Uruk period. Tepe Gawra contains material relating to the Halaf-Ubaid Transitional period c. 5,500–5,000 BC. Tell es-Sweyhat is the name of a large archaeological site on the Euphrates River in northern Syria. 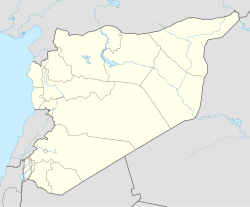 It is located in Raqqa Governorate roughly 95 km northeast of Aleppo and 60 km south of Carchemish. Also, an Uruk site of Jebel Aruda is located just across the river. The Jemdet Nasr Period is an archaeological culture in southern Mesopotamia. It is generally dated from 3100–2900 BC. It is named after the type site Tell Jemdet Nasr, where the assemblage typical for this period was first recognized. Its geographical distribution is limited to south-central Iraq. The culture of the proto-historical Jemdet Nasr period is a local development out of the preceding Uruk period and continues into the Early Dynastic I period. The art of Mesopotamia has survived in the archaeological record from early hunter-gatherer societies on to the Bronze Age cultures of the Sumerian, Akkadian, Babylonian and Assyrian empires. These empires were later replaced in the Iron Age by the Neo-Assyrian and Neo-Babylonian empires. Widely considered to be the cradle of civilization, Mesopotamia brought significant cultural developments, including the oldest examples of writing.